There is just one game on the NBA schedule on Thursday but it carries playoff implications when the Indiana Pacers visit the Milwaukee Bucks. 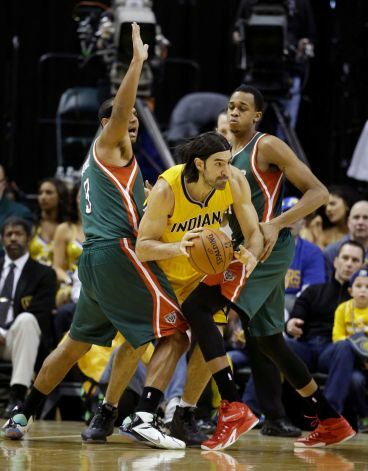 Both teams were able to win their last game, but Milwaukee is 3-7 over its past 10 and Indiana 4-6. Nevertheless, both are battling for playoff spots in the Eastern Conference. Milwaukee is currently in sixth place two games in front of seventh place Miami and four in front of both Boston and Indiana who are tied for the eighth and final playoff spot. Milwaukee on the season is 35-36, while Indiana is 31-40. The current line has Milwaukee favored by 1.5 points with the point total sitting on 186.5 for the over/under. The Pacers were in a free fall tumbling out of the playoff picture but their 103-101 victory against the Washington Wizards on Wednesday put them back into the playoff race. Guard George Hill scored 29 points, grabbed 7 boards and dished out 9 assists on the night. Indiana was down by 10 points during the fourth quarter before rallying for the win. With that win, the Pacers moved into a tie with the Celtics for the eighth spot, but Boston owns the tiebreaker. Milwaukee won on Tuesday to end a losing streak of six games. The Bucks defeated Miami 89-88 in a thriller. The Bucks were led by Ersan Ilyasova with 19 points and 11 boards, while Giannis Anteokuonmpo scored 16. However, Khris Middleton received the ball on a busted play and scored a three pointer to win the game at the buzzer. With its win, Milwaukee gained its current two-game cushion over the Heat. Indiana is 1-4 against the number in its past five games played on no rest and 1-6 against the spread in its past 7 games overall. Milwaukee is 7-15-1 against the number in its past 23 games overall, but just 1-4 against the spread in its past five games played at home. The underdog head to head is 5-1 against the number in the past six games between the two teams. The visiting team has covered the spread in each of the past 5 games between the two teams. Indiana has won two of the three head-to-head games this season with Milwaukee including an overtime 109-103 win on March 12 in Indiana. The Pacers and the points look strong in this matchup with a slight lean toward the OVER as well. (c) Betting Sports – Read entire story here.